SPIRITUALITY SCIENCE – THE KNOWER – THE KNOWING-SELF : WHO AM I ??? HOW DOES THE BODY KNOWS THE IDENTITY OF MAN WHO LIVES INSIDE THE BODY ??? IF THE BODY KNOWS ITS OWNER, OR IF THE OWNER KNOWS THE BODY HE OCCUPIES, THERE IS A FUNCTION CALLED KNOWING SELF. SPIRITUALITY SCIENCE – THE KNOWER – THE KNOWING-SELF : MAN, THE ENTIRE HUMAN ORGANISM IS DERIVED FROM A SINGLE FERTILIZED EGG CELL . HOW IS THE IDENTITY AND INDIVIDUALITY IS ESTABLISHED AND IS KNOWN IN THIS COMPLEX MULTICELLULAR ORGANISM ??? SPIRITUALITY SCIENCE – THE KNOWER – THE KNOWING-SELF : IN THE DIVINE SONG CALLED THE BHAGAVAD GITA, CHAPTER II, SANKHYA YOGA, VERSE#13, LORD KRISHNA EXPLAINS THE RELATIONSHIP BETWEEN MAN AND HIS CHANGING FORM OR APPEARANCE. As the embodied Soul continually passes in this body from boyhood to youth and then to old age, a man of courage must not grieve about the passing of Soul after the body dies. 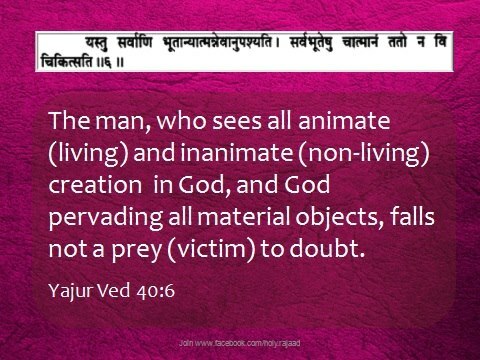 This verse needs a very careful interpretation for Matter is neither created nor destroyed. The condition called death applies to the Form or appearance while the Matter has the divine attribute called imperishability. The Soul preserves the Individuality of the Individual who passes through various stages like childhood, youth, and old age with varying physical identities. SPIRITUALITY SCIENCE – THE KNOWER – THE KNOWING-SELF : IN INDIAN TRADITION, THE TOTAL MATERIAL SUBSTANCE OR MATTER IS CALLED BRAHMA AND LORD BRAHMA IS THE CREATOR AND IS ESSENTIALLY PRESENT IN THE MATTER THAT HE CREATES. 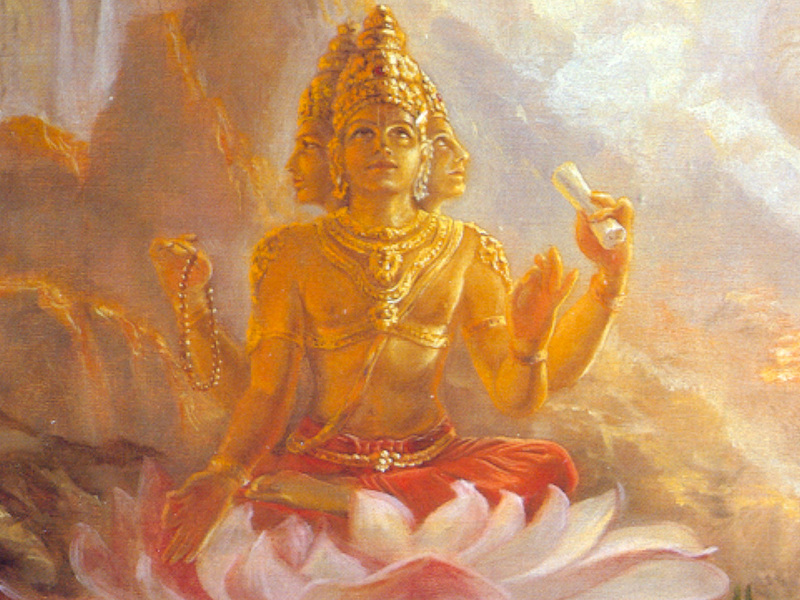 The Bhagavad Gita, Chapter XIV, Gunatraya Vibhaga Yoga, Three Modes of Material Nature, verse#3 describes the total material substance as Brahma, is the source of birth, and in that Brahma, Lord Krishna causes pregnancy(or the generation of varied forms) and thereby causing the possibilities for the births of all living beings. If Matter is Brahma, Lord Krishna is the Creator of Form or appearance using His creative potency which in Indian tradition is described as ‘Maya Shakti’. Brahma, Prakriti or Material Nature describe the material substratum pervading physical existence. Inanimate and inert Earth, Water, Fire, Air, Ether along with Manas(the seat of Mind, Buddhi, Intellect), and Ahankara(EGO) together constitute Lord Krishna’s eightfold material energies or differentiated aspects of Matter. SPIRITUALITY SCIENCE – THE KNOWER – THE KNOWING-SELF : MAN IN HIS INQUIRY ABOUT SELF, MUST UNDERSTAND THE RELATIONSHIP BETWEEN MATTER AND FORM AS BOTH REPRESENT THE DIVINE ATTRIBUTES OF A SINGLE INFINITE SUBSTANCE. Both Matter and Form represent the divine attributes of a single, infinite Substance. In the Bhagavad Gita, Chapter XIII, Kshetra – Kshetrajna Vibhaga Yoga, verses 1,2, and 3 describe the material body as the Field of Activity called ‘KSHETRA’ and one who knows this body is called the Knower of the Field of Activity or ‘KSHETRAJNA’. Lord Krishna further clarifies that He is also the Knower of the Field of Activity in all living bodies. In Indian tradition to understand the human body and its owner is called Knowledge or ‘JNANA’. SPIRITUALITY SCIENCE – THE KNOWER – THE KNOWING-SELF : MATTER REPRESENTS GOD AS UNMANIFESTED REALITY FOR GOD’S FORM OR APPEARANCE CANNOT BE DISCERNED BY SIMPLY EXPLORING MATTER. THE LIVING THINGS ACQUIRE A HUGE DIVERSITY IN THEIR FORMS AND APPEARANCE BECAUSE OF A CREATIVE POTENCY(MAYA SHAKTI) THAT TRANSFORMS MATTER INTO LIVING FORMS. The subject of man’s inquiry about Self is not about investigating the Infinite Substance or Nature called God. Man must explore his own body and understand what he knows and as to how he knows his own identity. For purposes of clarity, I divide man into two categories; 1. SELF which represents man as a Physical, Mental, and Social being. Self represents the thinking person, and the feeling person, or the person having thoughts and feelings, and 2. 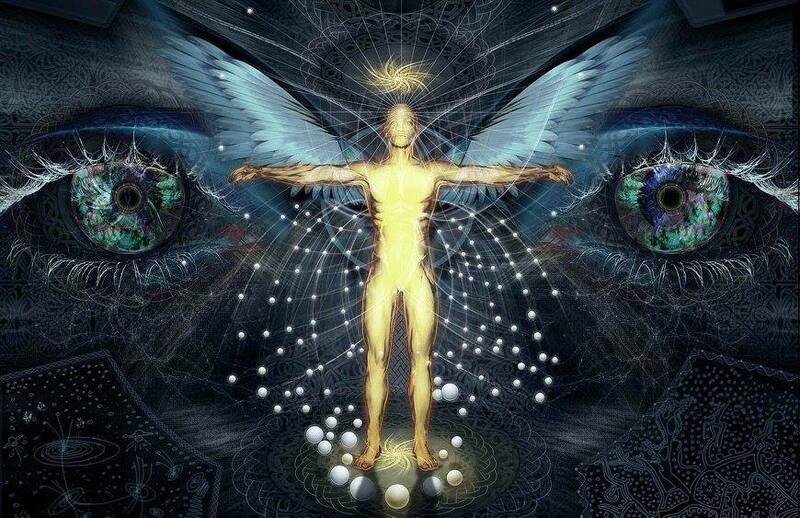 THE KNOWING-SELF which represents man as a Moral and Spiritual being. The Knowing-Self is the seat of consciousness where the contents of consciousness are composed in a very selective manner. The Knowing-Self is responsible for the condition called ‘AROUSAL’ that can keep man fully alert and awake. The Knowing-Self knows man’s thoughts, feelings, actions, and sensory experiences. The Knowing-Self plays a central role in maintaining and sustaining the vital functions like circulation, and respiration to support existence. SPIRITUALITY SCIENCE – THE KNOWER – THE KNOWING-SELF : IN THIS IMAGE OF HUMAN BRAIN, THE GREEN PORTION OF BRAIN STEM IS CALLED RETICULAR FORMATION. I AM PROPOSING TO CALL IT AS THE KNOWING-SELF AND IT IS THE “KNOWER” OF THE HUMAN BODY WHICH CONSTANTLY CHANGES ITS MORPHOLOGICAL APPEARANCE UNDER THE INFLUENCE OF TIME CALLED THE AGING PROCESS. Indian tradition and various religious and philosophical traditions speak about Soul, Spirit, and Atman without describing its precise location in the human body which is comprised of trillions of independent, individual living cells which have their own individual life span or lifetime. If the information about Soul, Spirit, and Atman is valid, there must be some useful or practical applications of that information. Indian tradition while being silent about the anatomical description of Soul, Spirit, and Atman, speaks about the hierarchical arrangement of mental functions and guides man to control or exercise supervision of his intellect, mind, sense organs, and the body. SPIRITUALITY SCIENCE – THE KNOWER – THE KNOWING SELF : INDIAN TRADITION AND OTHER TRADITIONS OF WORLD DO NOT DESCRIBE THE PRECISE ANATOMICAL LOCATION OF SPIRIT, SOUL, OR ATMAN. THIS IMAGE DESCRIBES THE HIERARCHICAL RELATIONSHIPS THAT MANAGE MAN’S MENTAL FUNCTIONS. 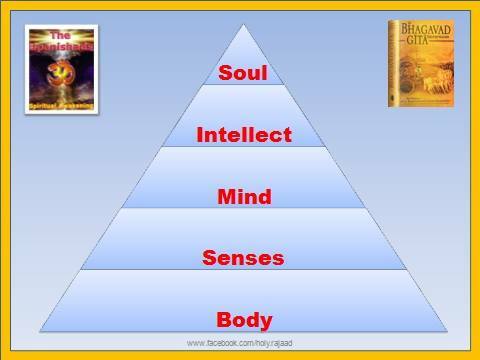 THIS MODEL SUGGESTS THAT SOUL IS THE CONTROLLER OF INTELLECT, MIND, SENSE ORGANS, AND BODY. 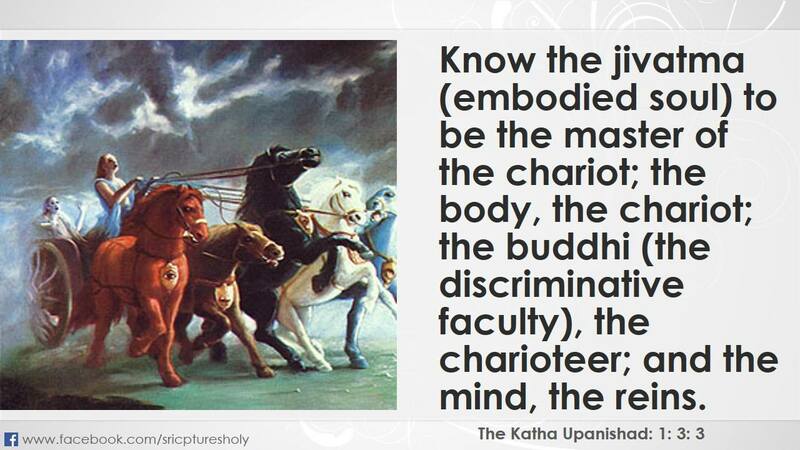 SPIRITUALITY SCIENCE – THE KNOWER – THE KNOWING-SELF : THIS STATEMENT FOUND IN KATHA UPANISHAD – 1:3:4 IS OF INTEREST AS IT DESCRIBES THE STRUCTURAL, AND FUNCTIONAL ORGANIZATION OF MAN. This statement may not give the precise location of Soul or Atman in man’s human body but shows as to how man manages his intellect(BUDDHI) to apply restraint on his mind which in return controls the organs of sense perception which are in hot pursuit of desires and cravings of the body whose actions and responses are driven by the sensory experiences of various kinds. It uses the analogy of a Chariot to assign Man and his organs to perform specific roles. 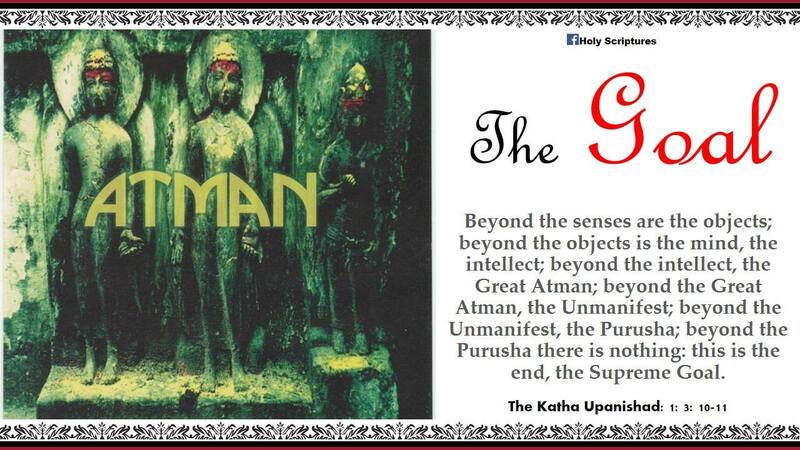 SPIRITUALITY SCIENCE – THE KNOWER – THE KNOWING-SELF : FROM KATHA UPANISHAD WE GET A DESCRIPTION OF MAN AND HIS STRUCTURAL AND FUNCTIONAL ORGANIZATION WHILE HE LIVES HIS LIFE CHASING HIS DESIRES. This statement must be carefully interpreted for it can have useful practical applications in promoting Man’s Physical, Mental, Social, Moral, and Spiritual Well-being. 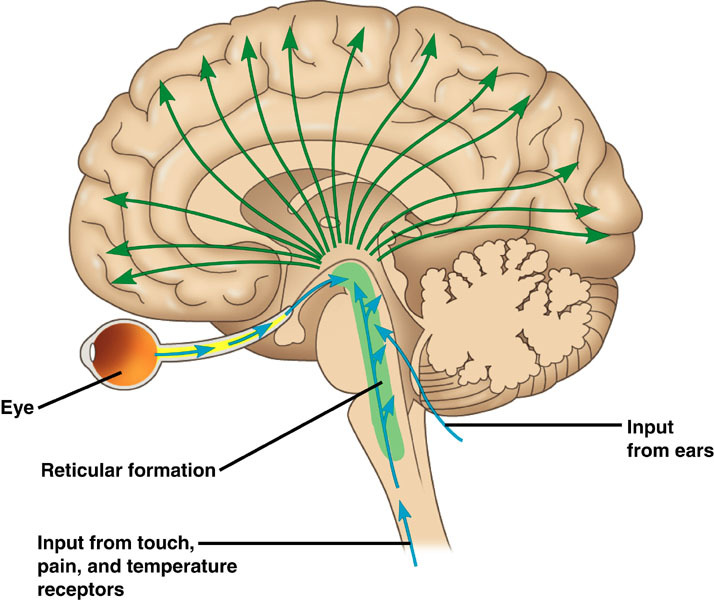 SPIRITUALITY SCIENCE – THE KNOWER – THE KNOWING-SELF : USING THIS STATEMENT, I WANT TO DESCRIBE MAN, SELF, SOUL, SPIRIT, OR ATMAN AS RESIDING IN THE RETICULAR FORMATION OF BRAIN STEM. Indian tradition is fully concerned about knowing the ‘identity’ of things. My concern is about the ‘unity’ of various parts to establish the Objective and the Subjective Reality of Man’s existence in the natural world. Man is a Mortal Being and his physical existence provides a finite experience for it is related, connected, bonded, associated, partnered or yoked with an Infinite Substance of which Soul, Spirit, or Atman is of interest for it brings Unity between the Infinite and Finite Man’s Physical Reality. SPIRITUALITY SCIENCE – THE KNOWER – THE KNOWING-SELF : TO KNOW MAN, THE SELF, SOUL, SPIRIT, OR ATMAN AS THE KNOWER OF BODY IS THE FIRST STEP IN MAN’S INQUIRY ABOUT SELF. 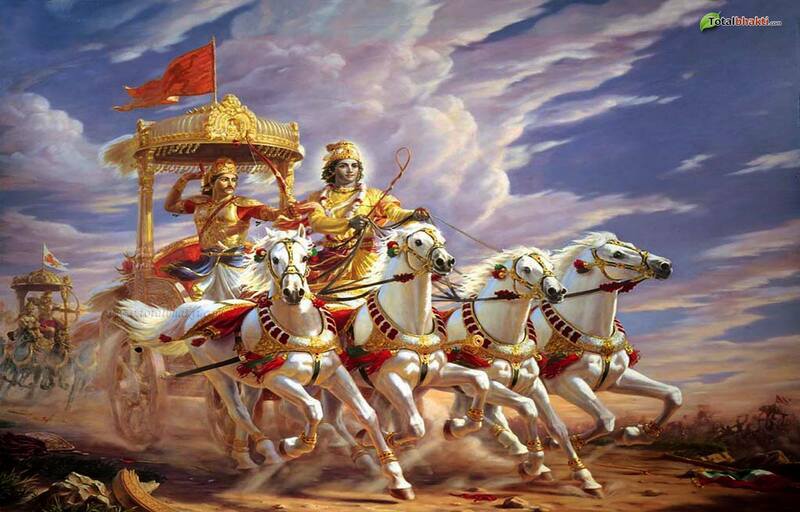 THE KNOWLEDGE WILL HELP AND GUIDE MAN TO REACH HIS DESTINATION USING HIS BODY LIKE A CHARIOT. 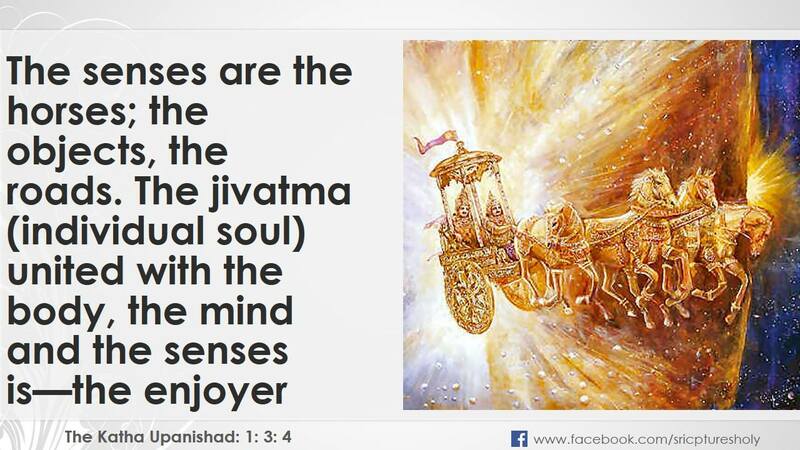 Using the analogy of a ‘CHARIOT’, Man can reach the Final Destination or ‘The Goal’ using the Knowledge(JNANA) about Self, Soul, Spirit, or Atman.